Let me offer a list of forecast notes, as you make your "go, no-go" decision for this wintry day. —Bottom Line: Travel will be treacherous across much of New Jersey during the day Tuesday. Snow turns to an icy mix of sleet and freezing rain, before changing to all rain. —Radar shows a few streaks of snow early on this Tuesday morning. As of this writing, it has already flipped to wintry mix or rain along NJ's southern coast. Nothing heavy yet. And it's not even snowing everywhere in the state yet — again, running a few hours behind schedule. Live weather radar. Blue=Snow, Pink=Mix, Green=Rain. —For now, snow bands are battling a very dry atmosphere. Things will moisten up as heavier precipitation arrives later in the morning rush hour. —Temperatures range from 17 degrees (North Jersey) to 36 degrees (South Jersey). Live temperatures across New Jersey. —The latest forecast has no substantive changes. Given the latest model guidance, I am still comfortable with the numbers I've been promoting in my forecasts, leaning toward the lower end of my snow estimates (Coating south, 1" central, 3" north). Along with the threat for significant icing (0.25" north). —It's not just the snow. North Jersey's atmospheric profile will be conducive to an extended period of freezing rain and sleet. That's the worst-case scenario here. At least snow offers some traction. Ice does not. —The pivotal moment will be around 9 a.m. That's when "prime time" for this storm system begins, with the heaviest precipitation bands arriving in New Jersey. If you're already seeing rain at that point, it will be rain for the duration. If your temperature is still at or below freezing, conditions will go downhill very quickly. A Winter Storm Warning continues for six and a half counties in interior North Jersey until last Tuesday night. A Winter Weather Advisory is in effect for the rest of the state (except Cape May County). Both the warning and advisory serve as a formal "heads up" to potentially hazardous travel conditions. Current weather warnings and advisories. Pink=Winter Storm Warning, Purple=Winter Weather Advisory. 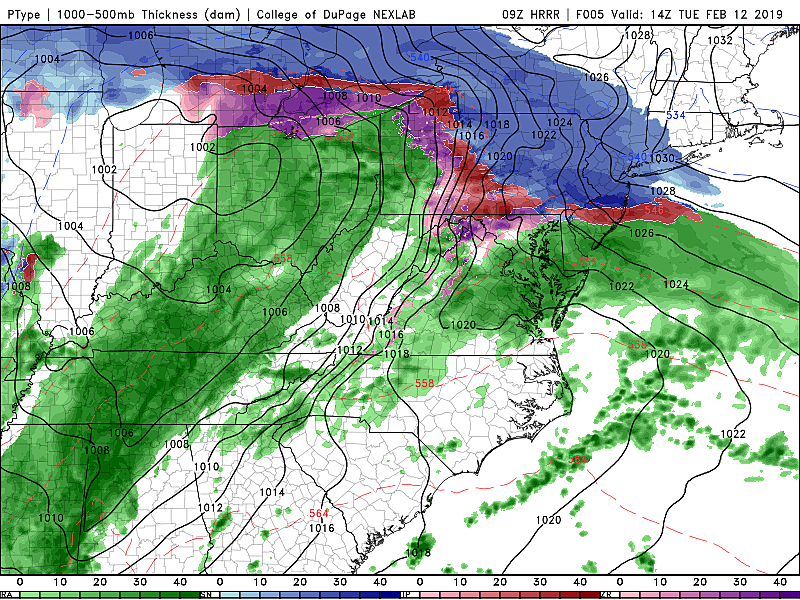 —By Tuesday afternoon, the transition from "wintry" to "wet" will be almost complete, aside from far northern New Jersey. —Periods of heavy rain will continue through Tuesday night and early Wednesday morning. —Clearing skies and a gusty wind, up to 40 mph, will take over by Wednesday afternoon. —The extended forecast shows a pleasantly partly sunny day on Thursday, a bit of rain on Friday, and then some light snow over the weekend. Can you make it to work today? Probably, if you leave early enough. Will you make it home later? Probably, as long as you can handle driving through some rain and slush. Driving during the workday? Treacherous, snowy, and icy. Our weather, news, traffic, and talk teams are on the clock to bring you the latest info before, during, and after our latest blast of winter.